Nicknamed the “City of Angels,” Los Angeles is the most populous city in the state of California, the second-largest city in the country after New York City, and one of the coolest cities to visit given the thousands of sights and attractions located here. Situated in the southern portion of California, Los Angeles is known for its pleasant Mediterranean climate, ethnic diversity and harmony, sprawling metropolis, and as a major center of the American entertainment industry—L.A. County is home to Hollywood and many other cities that host movie and television studios. Los Angeles lies in a large coastal basin surrounded on three sides by mountains reaching up to and over 10,000 feet (3,000 m), and the fourth side by the massive Pacific Ocean. The city of Los Angeles is the focal point of the larger Los Angeles metropolitan area and the Greater Los Angeles Area region, which is home to 13 million and over 18 million people, respectively, as of the last census. Los Angeles is the seat of Los Angeles County, the most populated county in the United States. Los Angeles is often billed as the “Creative Capital of the World,” because one in every six of its residents works in a creative industry and there are more artists, writers, filmmakers, actors, dancers and musicians living and working in Los Angeles than any other city at any time in history. Los Angeles is home to a number of great theme parks, performing arts centers, and over 800 museums and art galleries. Add to this the wealth of outdoor recreation opportunities and you have a city that is visited by millions of people each year. In the following article we will highlight five of Los Angeles’ most popular and oft-visited attractions, and provide a brief description highlighting some of the selling points associated with each of these attractions. When you’re preparing your touring itinerary for your upcoming visit to Los Angeles, make sure to include the visual masterpiece that is the Getty Center. The Getty Center is one of the most awe-inspiring and grandiose architectural achievements, not just in Los Angeles and California, but throughout the entire country and world. And as an added bonus, the center also plays host to some of the finest works of art on the globe. Architectural buffs will marvel at the Getty Center’s design and construction. The circular concrete and steel structure was planned and designed by the renowned architect Richard Meier—a master in his field—and the building houses a grand number of artistic pieces representing a variety of countries and artistic Ages. Here guests will find a wide assortment of Renaissance paintings; a collection of 20th century American photography; and several statues from the Baroque period. Also housed here are ancient Byzantine illuminated manuscripts; and many European-themed works that are literally worth their weight in gold. The sprawling modern grounds of the Getty center are set against a breathtaking backdrop amid the towering Santa Monica Mountains, and on a clear day the grounds and building offer spectacular views of the entire Los Angeles Basin. Tourists who have visited the Getty Center are quick to point out its precision construction and design, and praise the museum for its value and beauty—a place that brilliantly highlights the contrast between the art center’s subtle refinement and its over-the-top glitz that is so very representative of Los Angeles and Hollywood. The Getty Center is located just north of Santa Monica off the popular and often crowded Sepulveda Boulevard. Parking costs $15 per vehicle (or $10 after 5:00 PM), but entry into the Getty Museum itself is completely free of cost. The Getty Center Museum is open Tuesday through Saturday from 10:00 AM to 5:30 PM, and is closed on Sundays and Mondays. Situated on the south face of Mount Hollywood overlooking the Los Angeles Basin, the Griffith Observatory and its namesake park where it is located offers visitors some of the most impressive panoramic views of the many unique Los Angeles neighborhoods and its sprawling population moving ever closer to the shores of the Pacific Ocean. Naturally, the Griffith Park Observatory and Park experience is more than just a great opportunity for scenic photos. 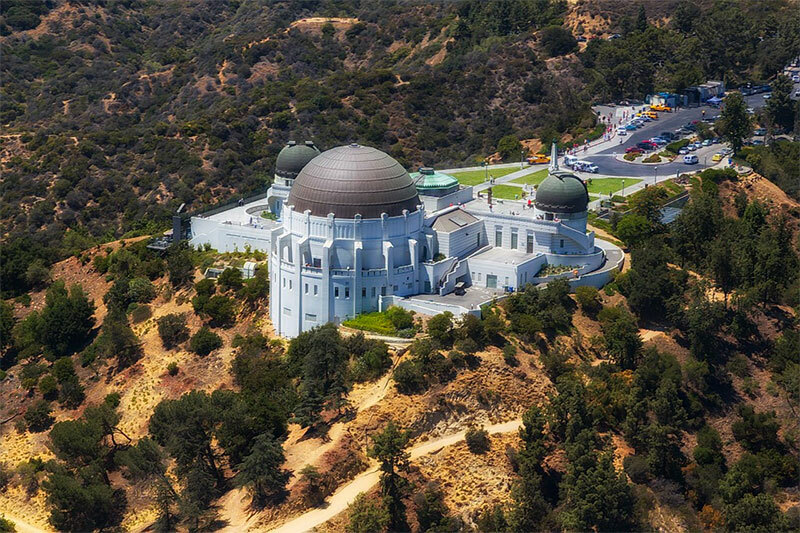 Considered a one-of-a-kind type of attraction (outside of universities) in California, the Griffith Park Observatory is home to some truly fascinating exhibits and a planetarium that is simply amazing. As the lights go out in the planetarium, guests are treated to a wonderful and very vivid educational experience with regard to the moon, stars, planets and the many galaxies that populate our sky. As they recline in their seats in the blackened auditorium, they will feel as if they are up close and personal to the nighttime sky, while expert astronomers explain exactly what they are viewing. A good number of guests that visit the Griffith Park Observatory—all of whom get in totally free of admission—cite the park’s amazing scenery and views as the major draw associated with this attraction, while others point to the planetarium and the high-powered telescopes as the site’s most amazing aspects. Although entry into Griffith Park costs nothing, the planetarium shows do cost between $3 and $7 for all visitors over the age of 12. Tickets to the Griffith Park Observatory and Planetarium can be purchased either online or at the park on the day of the show/demonstration. If you’re looking to spend some quality time with the family outdoors, perhaps even have a picnic at this 4,200 acre park, the Griffith Park Observatory is one of the best places to be in Los Angeles. Locals of the Los Angeles and Southern California area agree that the best way to beat the blazing heat of the summertime months is to head to the beach—and no shoreline is finer than Malibu’s Zuma Beach. While it’s certainly true that the Malibu suburb of Los Angeles is well known for its excessive wealth and exclusive estates, all of its beaches are completely free of charge, allowing visitors to check out the local Zuma Beach scene while getting a deep, dark California tan. Quite simply, if you’re looking for a Los Angeles beach locale that offers the best in swimming, sunbathing and people watching, you need look no further than Zuma Beach—a beach that is much cleaner and safer than the popular Venice Beach and Santa Monica shores. Malibu’s Zuma Beach is considered one of the finest shorelines in Western Los Angeles County. Both locals and tourists can regularly be found here, taking advantage of all the hot spots the beach has to offer. In addition to the great surf, safe conditions and clean, groomed sand, Zuma Beach features some of the best coastal shopping in California, and its restaurants and eateries are the stuff of legend. Whether you’re looking for a simple cheeseburger, hot dog, nachos or other beach favorites, you will definitely find it at Zuma Beach. Additionally, there are several four-star and five-star restaurants just blocks away, where patrons can dine on some of California’s best surf and turf-type fare, including steaks, prime rib, shrimp, crab, lobster and the catch of the day, delivered fresh from the fishing boats daily. Zuma Beach has ample parking and is very easy to access, and there are plenty of lifeguard stations patrolling the area to ensure the safety of beachgoers. Bathrooms and outdoor showers are also available, and certain parts of the beach include large fire rings designed to host nightly bonfires after a long day of swimming, shopping and tanning. The city of Malibu is situated to the northwest of Central Los Angeles, just a 30-40 minute drive from downtown (depending on traffic conditions). While you are in the area, be sure to check out the Getty Villa and the artwork contained within, a tour that is free to the general public. When visiting the city of Los Angeles, the celebrated hub of the motion picture industry, it only stands to reason that you should take in a movie at the most iconic theater palace in the world: The TLC Chinese Theater. Boasting more than 50 special events each year, including film festivals, imprint ceremonies and, of course, a number of movie premieres, the TLC Chinese Theater continues to solidify its position as one of the greatest theaters in the long and storied history of Hollywood and the Greater Los Angeles Area. Since 1927, the TLC Chinese Theater (which has had many different names over the decades), has been home to some of the most important and exciting “red carpet” movie openings and other special events. Over the years, the theater has welcomed some of Hollywood’s biggest stars, who gather regularly to promote their new pictures. Guests of the TLC Chinese Theater will have the amazing opportunity to check out the distinctive “Forecourt of the Stars,” an area that features cement hand and footprints of some of the greatest actors, directors and producers of all time. This wonderful feature, along with the abundance of movie memorabilia that adorns the walls, makes the TLC Chinese Theater one of the most renowned and well-loved cinema houses on the globe. When visiting the TLC Chinese Theater, make sure you check out one of the IMAX productions featured here. The theater boasts the absolute largest IMAX auditorium in the world, offering films shown in 3-D style and full surround-sound that will simply blow you away. Watching a movie at the TLC Chinese Theater is more than just a regular night at the movies; it’s a memorable experience that cannot be replicated. The laser experience at TLC’s IMAX Theater represents a quantum leap in cinematic technology—providing audiences the sharpest, brightest, cleanest and most colorful images ever seen. Couple this experience with the opportunity to be pampered in comfortable, reclining seats with waitress service, and you get a good idea of what the experience is like at the TLC Chinese Theater. Considered one of the finest educational attractions in Los Angeles County, the La Brea Tar Pits are a collection of ancient tar pits, surrounded by Hancock Park, in urban Los Angeles. Here, natural asphalt has seeped up from the ground for tens of thousands of years; and over many hundred years, the bones of animals—many of which are prehistoric—that were trapped in the tar have now been preserved and are on full display. The La Brea Tar Pits are flanked by the George C. Page Museum, a facility dedicated to researching the tar pits and displaying the many animal specimens that have died there. Many years ago, the La Brea Tar Pits gained the status of a United States National Natural Landmark. The La Brea Tar Pits and Hancock Park are positioned in what was once the “Mexican Land Grant of Rancho La Brea,” now part of the Miracle Mile portion of urban Los Angeles, and adjacent to the Los Angeles County Museum of Art and the Los Angeles Folk Art Museum.